Taylor Seyler from Independence, Missouri became a first-time mom when her son Keighan was born two months ago. She breast-feeds exclusively, but needed a little help to supplement. That's when she bought a can of Similac baby formula and made a bottle for her son. "Two ounces down I noticed the worms and I was like oh. That's great," she said. "Took it from his mouth, went and put a napkin over the faucet and we poured it down the drain and we saw the maggots on it." Seyler snapped some pictures and posted them on Facebook. They've been shared more than 43,000 times already. She added, "I was aware. Didn't really think anything of it, but it happened to me and now I don't want it to happen to anyone else. I don't want anyone else's baby to consume worms. That's really gross." "We take all concerns about product quality and safety seriously. Parents can be confident that our Similac infant formulas are safe. A third-party entomologist has reviewed the photos and concluded that based on the life cycle, and the age and size of the Indian meal moth larva in the photos, they entered the product after it left our facilities and the safety seal was removed. Our products pass rigorous safety and quality checks, including numerous steps to check for foreign objects and ensure proper packaging. Indian meal moths are very common and can often be found in kitchen pantries inside flour and cereal. To prevent contamination, caregivers should inspect products before use and practice safe handling with powdered formula, including washing hands, closing containers tightly after each use and storing products in a dry, cool, clean place." This story isn't a unique one. Mother of four, Helen Williamson from Lee's Summit had a similar experience with Nutramigen formula. "I went to burp her like normal. I happened to glance over at the bottle and saw you know waves. I pick up the bottle and hold it in the light and I see worms like inching up. Pick up the can and looked in it and saw pieces of the formula moving inside the can. So I was like oh my gosh," said Williamson. “I just feel like they're not doing something right because there wouldn't be, I'm sorry they look like maggots to me. 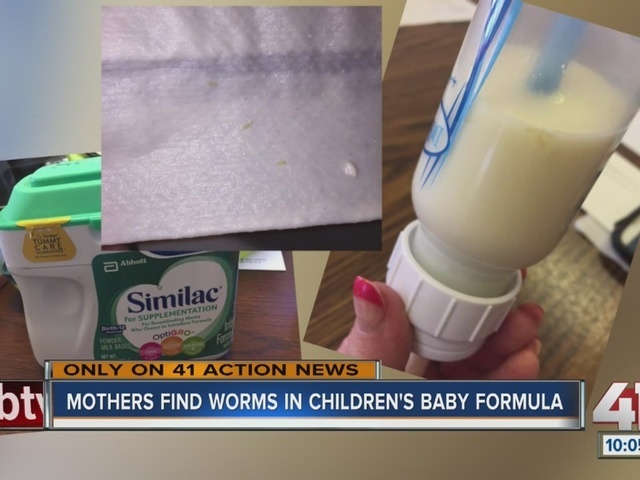 There wouldn't be maggots crawling around in my baby's bottle." “We can share with you that we have not received any similar complaints on this batch of Nutramigen. As we understand the situation, the can of product had been opened by the consumer the day before it was used. It is important to note that the introduction of foreign matter into any Mead Johnson product during the manufacturing and packaging process is extremely unlikely given our numerous stringent safeguards and quality control procedures." Williamson is disappointed because she says, "You know I depend on that company and this is what happens then I hear that this isn't the first time. It's not right. It really isn't."